Notre Dame remained inconsistent on Wednesday night after an offensive outburst on Saturday against Boston College. 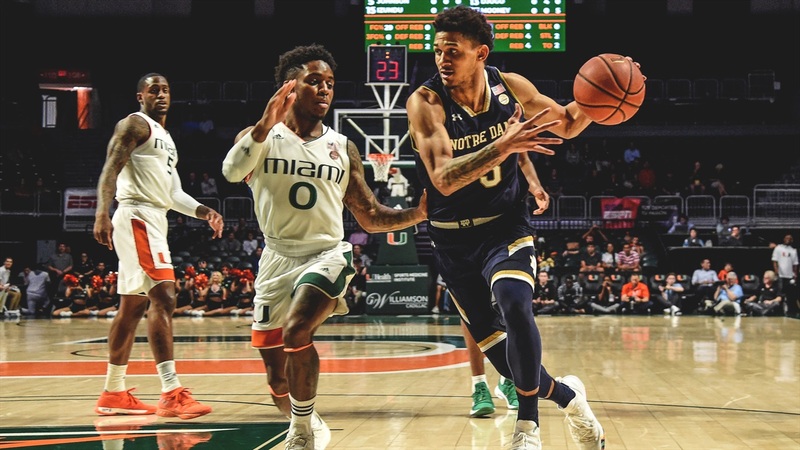 The Irish shot over 50 percent from the field and hitting double-digit three-pointers against the Eagles, but Notre Dame’s offense went silent against Miami inside the Watsco Center in Coral Gables in a 62-47 loss to the Hurricanes. After hitting five of their first seven shots, including three from long range in the first five minutes of the game, the Irish converted on just one more three-pointer on 28 total three-point attempts (4-28) and shot only 32 percent from the field (18-56). Notre Dame dropped to 12-11 on the year and 2-8 in ACC play. Miami cracked double-digits in the win column with the win to improve to 10-12 on the year and 2-8 in the ACC. Down five, 28-23 Notre Dame needed to find an answer coming out of the locker room after a slow first half. It never happened, the Hurricanes picked up where they left off and started the second half on a 6-0 run and extended their lead to double-digits, 34-23. Nate Laszewski finally got Notre Dame on the board two and a half minutes into the second half with a three-point play the old fashion way. The freshman scored on back to back possession to give the Irish life, but Miami countered both buckets and went onto a 15-5 run to open its lead to 15, 43-28. Miami kept a double-digit lead for the remainder of the game to silence Notre Dame. It was clear Notre Dame was frustrated, with no rhythm in its offense. The Irish turned the ball over 14 times and it led to 16 points for the Hurricanes. John Mooney’s double-double streak came to an end against Miami, but still finished with 11 points and six rebounds. DJ Harvey also finished with 14 points and was the leading scorer for the Irish. Miami shot 44 percent from the field (27-62). They couldn’t shoot from the perimeter but showed an interior presence led by Eduka Izundu who finished with 14 points and seven rebounds. DJ Vasiljevic added 14 points and Chris Lykes added 11. Sloppy offensive for Notre Dame resulted in eight first half turnovers for an Irish team who averages just 9.5 turnovers for an entire game. Two scoring droughts of four and a half and seven minutes defined a lackluster first half performance for the Irish and they went into halftime down 28-23 to Miami who hadn’t led going into the locker room for a month. Notre Dame went without a field goal for the last six minutes of the first half and only put points on the board late in the first half on two Harvey free throws. 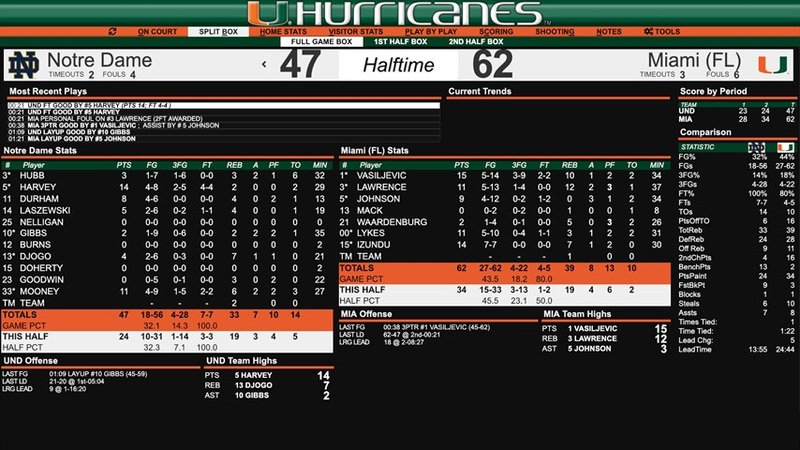 Sparked by a pair of buckets by Izundu and Sam Waardenburg and a pair of free throws by Vasiljevic, the Hurricanes ended the first half on a 10-2 run. Notre Dame and Miami went back and forth much of the first half until Miami pulled away late with its run going into the locker room. It was a promising start to the game by Notre Dame; they started five for seven from the field and jumped out to a 13-4 run sparked by three, three-pointers by Hubb, Harvey and Mooney. The Irish dominated the first five minutes of the game, but one of their two colossal scoring droughts in the first half quickly diminished their hot start. The Hurricanes went on a 9-0 run during the drought sparked by Chris Lykes to tie the game at 13 with 10:28 left in the first half. Notre Dame shot 32 percent from the field in the first half (8-25). They also were out-rebounded 20-14 by Miami. Mooney was yet again the only consistent component of the Irish team. The junior scored 11 points on four for six shooting. Miami shot 41 percent from the field in the first half (12-29). They also scored 11 points off Notre Dame’s turnovers which is the difference of the first half. 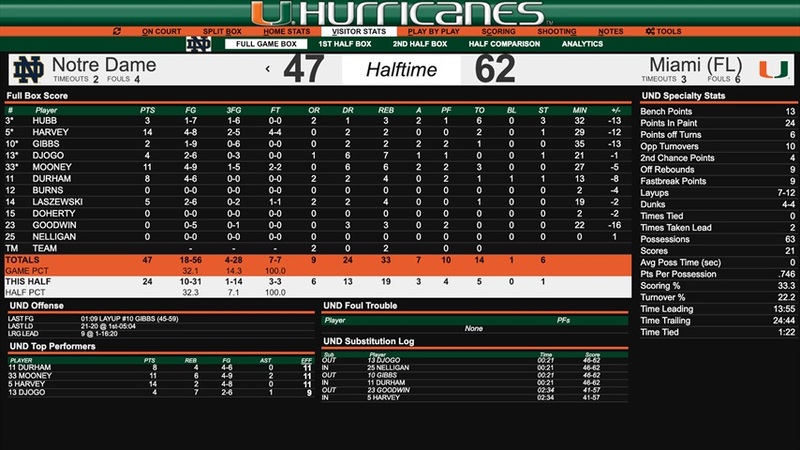 Izundu and Lykes combined for 17 points to lead the Hurricanes in the first half with 10 and seven respectively. Izundu also pulled down five rebounds.